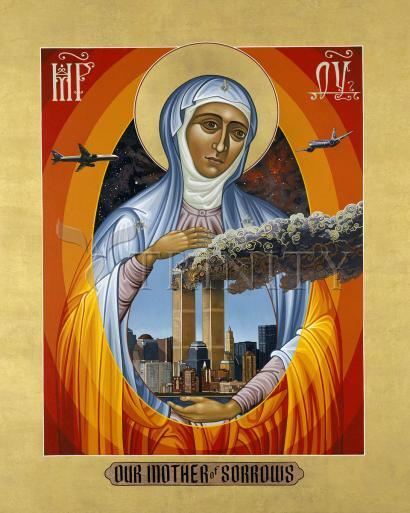 Our Mother of Sorrows offers healing liniment to those suffering from the tragedies of September 11, 2001. Old Spanish and Mexican images of Our Lady of Sorrows as well as the traditional icon of Our Lady of Perpetual Help influenced the conception of this icon. The angels of the Perpetual Help icon, as well as their instruments of Christ's crucifixion are replaced by the American and United Airlines planes. The planes symbolize the victims at the Pentagon and Flight 93, as well as both planes that crashed into the World Trade Center. The planes invade the sacred space of the mandorla, the cloud of heavenly radiance that surrounds Mary. Represented by the almond shape and the radiating fiery rings, the mandorla is the intersection of heavenly and earthly realms. The stars of heaven surround Mary, the universal mother, in her sorrowful yet hopeful glance. The old church Slavonic lettering in gold leaf describes Mary as the Theotokos, the Mother of God. Traditional images of Our Lady of Sorrows depict Mary's heart pierced by swords, symbolic of the seven times her heart was broken by the passion of her Son. Within Mary's embrace the oval which surrounds the World Trade Center symbolizes her sacred heart, but even more so her womb. In this icon, Our Mother embraces all those lost with her enduring love, just as she embraced the Child in her womb. The towers are depicted as they appeared on that bright, sunny morning in early September. The smoke, stylized and sanctified, bears witness to the ultimate sacrifice of so many on September 11. I may win the just soul's peace. Grant that in death's agony, etc. Be Thy Cross my victory. Amen.